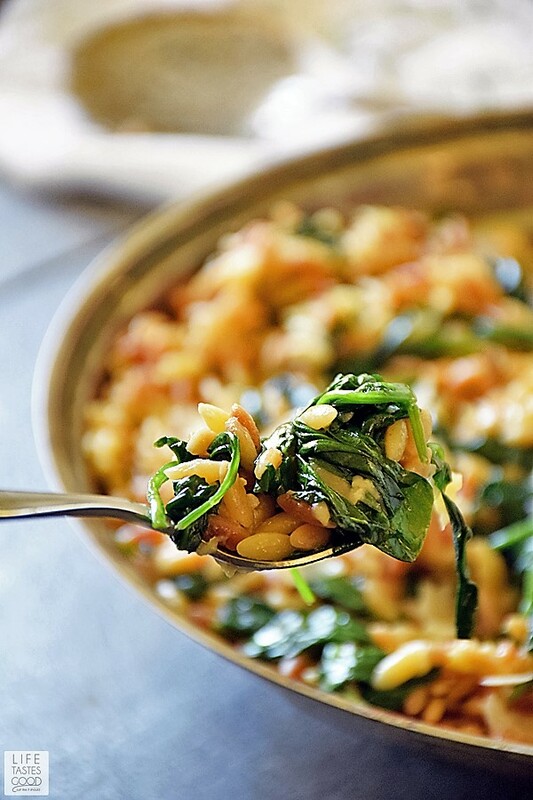 Orzo Pasta with Spinach and Parmesan is an easy recipe using fresh ingredients to maximize flavor. It makes an impressive side dish, but if you want an easy all-in-one meal, just add chicken for a delicious dinner that's quick and easy any night of the week. I LOVE orzo pasta! It is such a nice change of pace from rice. I'm not such a fan of rice - not the taste, the consistency. I eat it and it's okay, but I prefer to make orzo pasta. Sadly, Don (aka the hubs) really loves rice, so I've been trying to convince him orzo pasta is a better option. Don't get me wrong, he LOVES pasta, just not as a rice substitute - he's still a work in progress. I think you'll love how easily this orzo pasta recipe can be adapted to suit your needs. I know I sure do! I like how I can make this recipe as written for a delicious side to just about any protein, but we have also enjoyed this orzo pasta recipe as a meatless entree. A great addition I like to add from time to time is sauteed mushrooms, so don't be afraid to mix things up and experiment with this orzo pasta recipe. 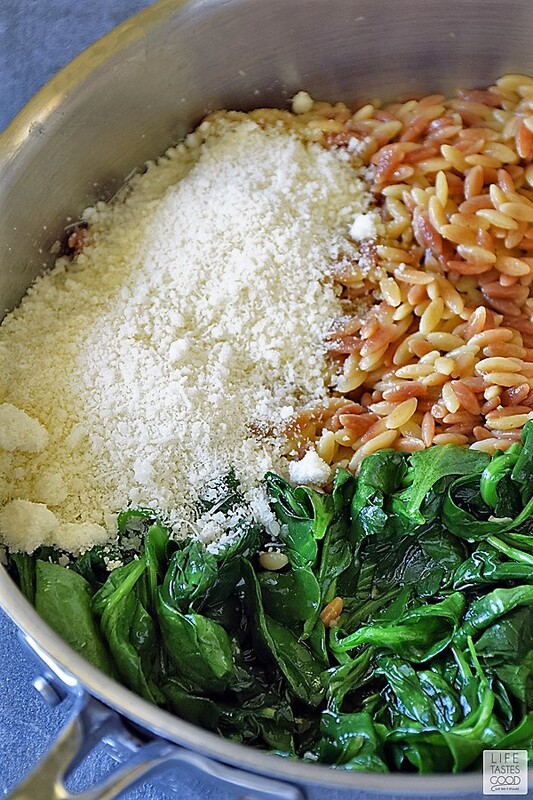 To make this all in one skillet, I sautee the spinach and garlic first and then remove it from the skillet and keep warm until the orzo pasta is done. Use a skillet with a tight fitting lid. If you don't have a skillet with a tight fitting lid, you can put a clean kitchen towel between the lid and the skillet to ensure a tight fit. 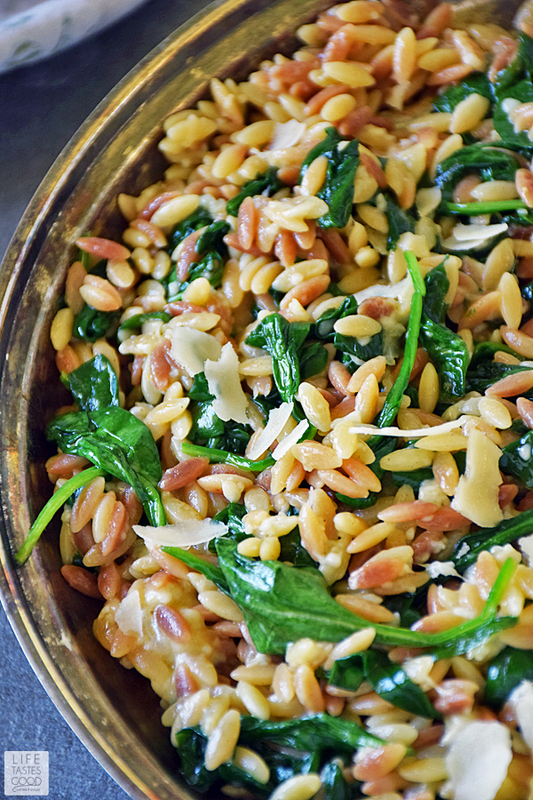 Orzo Pasta with Spinach and Parmesan is an easy recipe using fresh ingredients to maximize flavor. 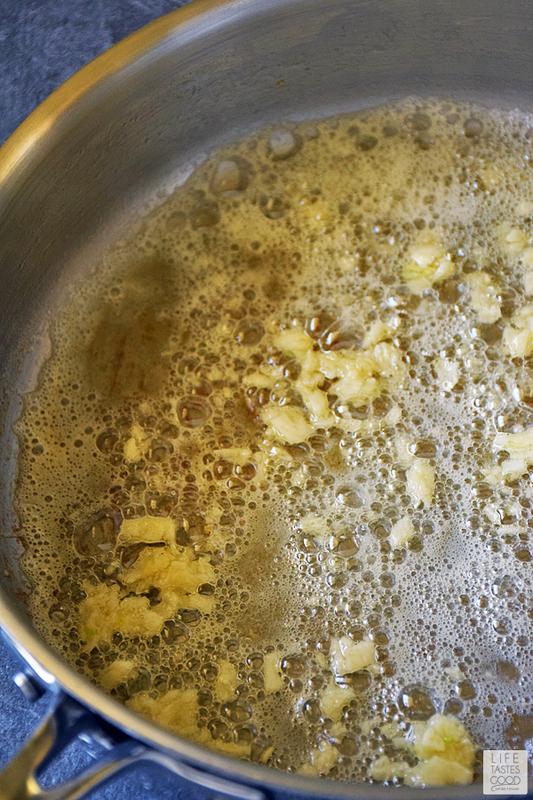 Melt 2 tablespoons of the butter in a medium skillet over medium heat and add 1 tablespoon freshly minced garlic. Saute for about 30 seconds until the garlic is fragrant. 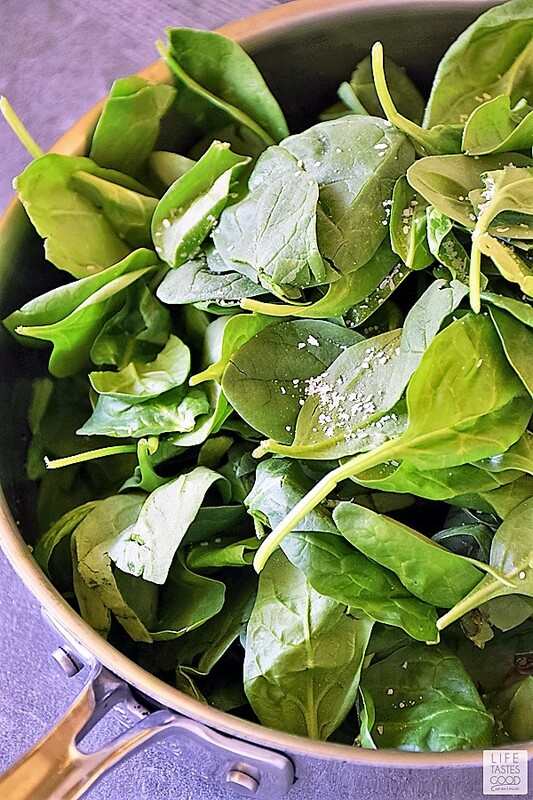 Add 6 ounces of baby spinach and a pinch of kosher salt. 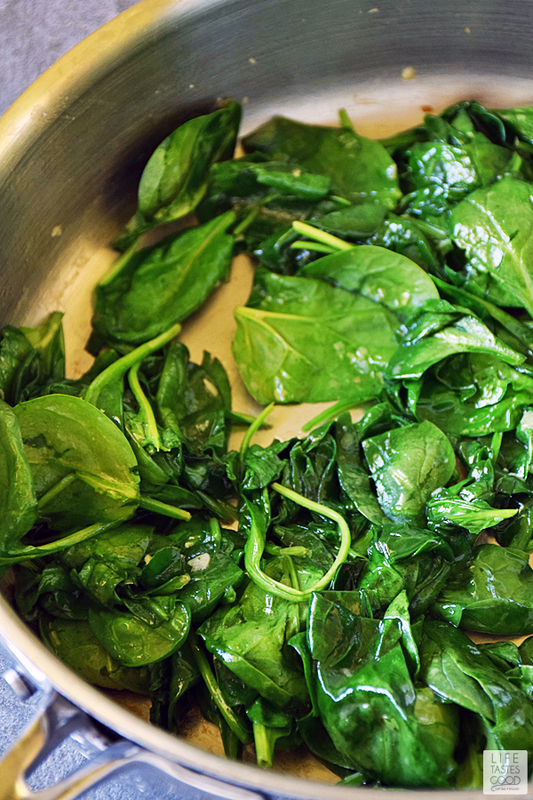 Saute until the spinach is wilted to your liking, about a minute or two. 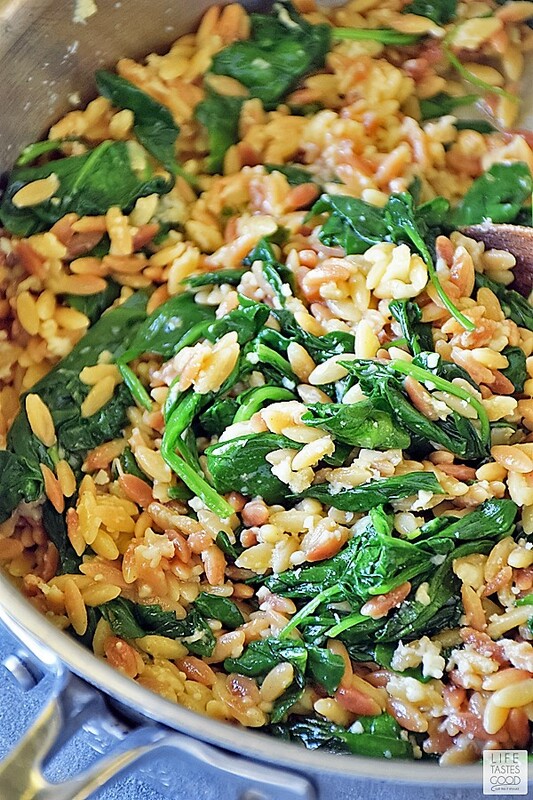 Remove the spinach from the skillet to a plate and reserve until ready to mix with the orzo. Increase the heat to mid-high and melt the remaining 2 tablespoons butter in the skillet. Add 1 cup orzo pasta and stir until lightly browned. Add 14 ounces of water and 2 teaspoons chicken base and bring to a boil. Cover. 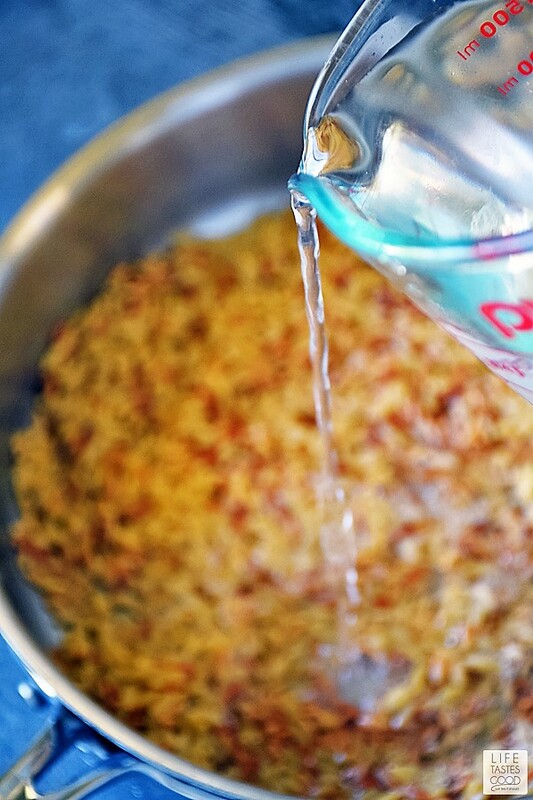 Reduce heat and simmer for about 15 minutes until the orzo is tender and the liquid is mostly absorbed. When the orzo is done add the spinach and 1/2 cup Parmesan cheese and mix well. Give it a taste and adjust the seasonings as needed. The Parmesan will add some saltiness to the dish, so be sure to give it a taste to ensure you don't add too much salt! 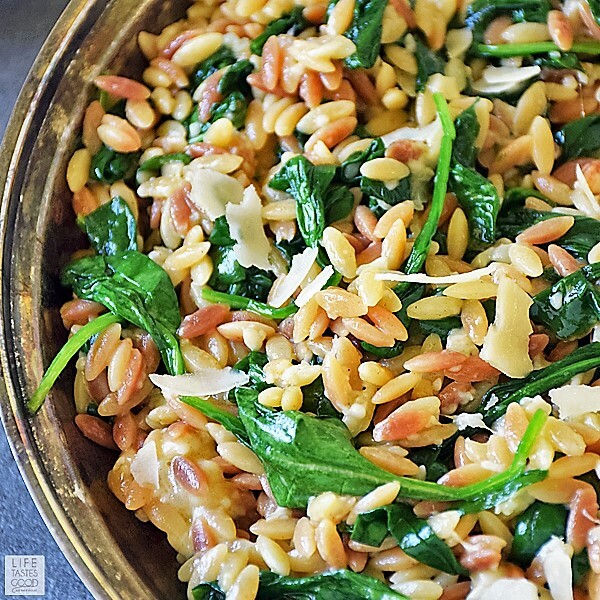 Remove the spinach from the skillet to a plate and reserve until ready to mix with the orzo. Increase the heat to mid-high and melt the remaining 2 tablespoons butter in the skillet. Add 1 cup orzo pasta and stir until lightly browned. Add 14 ounces of water and 2 teaspoons chicken base and bring to a boil. Cover. 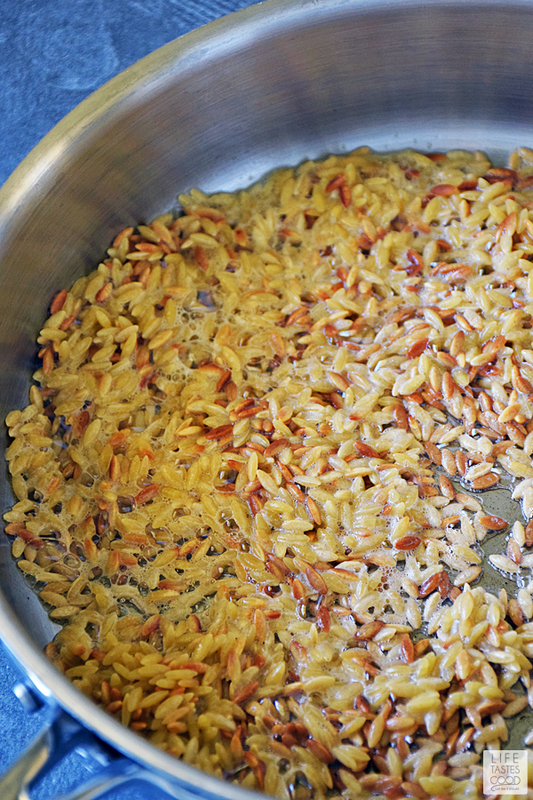 Reduce heat and simmer for about 15 minutes until the orzo is tender and the liquid is mostly absorbed. When the orzo pasta is done add the spinach and 1/2 cup Parmesan cheese and mix well. Give it a taste and adjust the seasonings as needed. The Parmesan will add some saltiness to the dish, so be sure to give it a taste to ensure you don't add too much salt! Yum yum yum...I ewcently re-introduced myself to orzo. Forgot how much I loved it! Omgosh! I love it! I pick orzo over rice any day! I am going to make this tomorrow for my daughter, but I've never used chicken base and don't know what it is. I looked it up and it seems it can be a powder or paste. What do you use? I just want to make sure I buy the right thing so I don't ruin this recipe! you are most welcome! Thanks for stopping by! Ok, we just finished it. YUM!! So good. My daughter said this should be one of my staple recipes now. I'm sure I'll mention it on my blog sometime soon. Thanks! Great! I'm so glad you liked it! It is definitely one I make often! 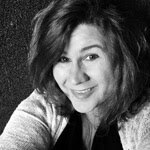 I love your blog and all things vintage too - I'm a new follower :). This looks delicious - but I have a quick question: Do you not cook the orzo in boiling water like you would any other pasta? Am I correct in thinking I cook the orzo in the 2T butter alone? I'll know when it's done by it's light brown color? Thanks! This is so AMAZING. I was extremely and pleasantly surprised. Thank you for the great recipe! Found this on pinterest and tried it tonight. Absolutely delicious. I didn't have chicken base, so i added that new concentrated stock to the water and let it boil. I actually think that i could cut the butter and it would still be divine. I will try that next time as it is definitely a keeper! I'm so glad you like it! You can absolutely cut the butter, but I recommend subbing in olive oil maybe using 1 tbsp olive oil and 1 tbsp butter to toast the orzo in place of the 2 tbsps of butter and you can do the same when sauteing the spinach. If you don't use enough butter/oil the orzo might stick and won't be as creamy, so it just depends on your preferences. Thanks for stopping by!! Just made this for dinner. It was marvelous! I used generic butter flavored spray (like Pam) to saute' the orzo. I didn't have the chicken base, so I used a 14.5 oz can of chicken broth. No water. I also used the spray for the spinach along with 1 Tbls of "I can't believe it's not butter". It was a bit pasty, not creamy but the taste was sure there. I served it with the "No fail Salmon" from Pinterest. Delish! Thanks for stopping by, Hope! I'm glad it turned out for ya! Chicken broth is a fine substitute. I used to use that until I discovered chicken base and now I'm addicted to the stuff haha. So happy you liked it, and I'm going to have to try that salmon! @Hope, I am not here to preach but please avoid using sprays like Pam. They are dangerous to health, I don't mean that lightly. Take care. Thanks so much for this recipe! I cooked it tonight and it was delicious! I cooked it just as you instructed and paired it with a honey-lime shrimp recipe I also found on Pinterest. Thanks again for sharing! I love ORZO and this looks very good and i am going to try it today. As soon as i get off of work i am going to the store to get every thing so i can make it. Thanks for stopping by Delores! I think you'll like it - it is a family fave in our house!! And so easy to make. Enjoy and have a great weekend! Hi - Looks delish :) I am making for a large group -- do you think I can double or even triple the recipe? Can i make ahead of time and heat later? Maureen, thanks for stopping by!! I would recommend making it in batches and then mixing it all together. You can make this ahead of time, however, the consistency suffers a little. I eat it for leftovers all the time and the flavor is still great! Just made this tonight! SO good, and my husband absolutely loved it. I'm going to check out your other recipes now to see what I'm making for dinner tomorrow :) Thank you! This was absolutely delicious and so simple! My husband loved it and has commented on how good it was several times since then. I used chicken broth to cook the orzo. We do not eat a lot of meat and I served this as an entree with a salad. YUM! Tried it tonight with grilled chicken and mushrooms. Sauteed the mushrooms with the garlic and then added the "pre-fab" chicken strips to warm through before adding the spinach on top. Divine! Bet this would be good with a pinch of nutmeg. I made this rather than my usual recipe with sun dried tomatoes, and liked it better!!! I paired it with Greek feta burgers and thought I was back in Greece!!! Thanks for this. Thanks for taking the time to comment!! You made my day :)! I'm so glad you like this recipe - it is definitely a favorite of ours. Mmmm. This looks awesome. I have had it pinned and plan to make it tonight with sirloin steaks. Thanks for sharing! Pure perfection!!! I followed the recipe with the exception of substituting Asiago for Parmesan. It was so lovely! I did not have to add any salt and pepper. I will make this often! Came across this on Pinterest. Cant thank you enough for posting this recipe. Its fool proof and came out delish!!!! Will definitely be making this again and again, it was the perfect side dish for my breaded meat. I made this for dinner tonight and it was delicious!! I used feta cheese instead of parmesan. I'm not a big fan of parmesan. We love trying new dishes and this was a big hit. Will make this again, no doubt!! Thanks so much for this recipe! It's fantastic! My husband said that this one is definitely a keeper. I'll have to try it with feta too as Mama Jules suggests above. It looks like there is crumbled bacon on top of the dish. If not bacon, what is it? Oooh, I can't wait to try this. I've made orzo with spinach and feta and it was wonderful. I think I'll try this with shrimp added for a yummy light dinner for hubby and myself. Goodness i am sooo happy you posted this recipe. Its absolutely tasty and perfect! Just made some to serve with dinner and boy is it good! Thank you so much for your comment. This makes me so happy!! I'm glad you enjoy it, Joanna! I made this for dinner tonight!! It was soo good! I will definitely be making again. I added sautéed mushrooms and sliced cherry tomatoes. I used olive oil for the mushrooms and spinach, but butter for the orzo. I found Better Than Bouillon at the store, I had never used it before. Next time I might use less parmesan because I ate it as an entree, and ate a lot of it... so just for my health :) but it would make an excellent side dish with chicken! This looks delicious! My daughter is allergic to maltodextrin and dextrose, which is in most boullion type chicken bases. What could I substitute with? Just made this and it was delicious. Even my picky eater had 2 helpings. Added broccoli, just because I had it on hand. Will definitely make again.